As we come into the 2018 building season we thought it would be a good idea to cover the top 10 framing errors seen most often in residential construction. It is valuable to note that most of these errors are very common and yet would be very easy to avoid if the installer pays attention to the details. Exterior Sheathing should always be installed over two or more spans. This means that there should always be three or more bearing points under any sheathing unit. In sheathing terms the strength axis refers to the longest length or span of a sheet. You should always try to install sheathing with this sheathing axis across the bearing points. When installing a narrow width panel which are usually considered to be any panel less than 24 inches wide, particularly on a roof surface, it is recommended that this panel be supported with blocking or edge clips as these narrow panels are more likely to flex when walked on causing roof damage. If you are installing a Glulam beam that will be used in an unbalanced installation there is a chance this beam was designed with a “Top” direction noted for proper deflection of the load. It is important to make sure the “Top” of the beam is facing correctly if it is noted on the beam. It is very important to understand that wood structural panels like plywood and OSB will have a tendency to shrink or expand depending on the moisture level. If proper panel spacing of 1/8” in both end and edge joints is not practiced the problem of buckling can occur when the products naturally expand. This is not a defect in product but an installation error. There are several possible framing fastener issues to be concerned with. Proper fastener size as well as making sure the fasteners hit a structural member are the most common problems in sheathing installation. Overdriving a fastener through the sheathing can also cause improper fastener strength. Every floor will deflect or move a little when walked on. If some joists are to close or spaced to far apart you will notice a difference in how in deflects or flexes when walking across this space. This is hard to repair after the floor is finished. The number one complaint in the home building industry is floor squeaks. The simple solution to avoiding this problem is thorough and consistent floor gluing and either nailing or screwing. This is another tough area to go back and repair if the job is rushed in the beginning. It can’t be stressed enough how important it is to control water access to the construction materials. It is important to seal the building envelope as soon as possible and to keep the working environment inside this envelope dry during the construction process. 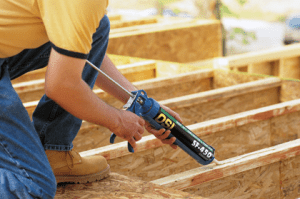 Cutting or notching of structural members like I-joists or rafters is a common problem which will lead to a weakened structural member and possible need to replace that member. Always confirm cutting and drilling limitations before cutting into a structural member to avoid the possibility of needing to replace that structural member. In concluding it is valuable to know that solid wood sheathing is the easiest way to meet structural bracing codes but it is important to remember that sheathing has its most strength along the longest axis. Also remember that proper fasteners are “the glue that holds it all together” so make sure you are using the correct fasteners and also make sure you are using enough fasteners to follow proper best practice.